"Stephen Richardson impresses with his very black Kaspar, deep timbred, theatrically frightening as one would wish and vocally thunderous..."
One of the most versatile and virtuosic soloists of his generation. British bass Stephen Richardson is equally in demand on the classical operatic stage and concert platform as he is for giving première performances of major contemporary works worldwide. Some of these include the roles of Stephano (Adès The Tempest) at the Royal Opera, Covent Garden; Kublai Khan in Tan Dun's Marco Polo at the Netherlands Opera, and The Emperor in Tea at Suntory Hall, Tokyo; Gerald Barry's The Triumph of Beauty and Deceit, The Conquest Of Ireland , The Intelligence Park and Beethoven ; Tavener's Eis Thanaton, Resurrection, The Apocalypse and Fall and Resurrection with City of London Sinfonia at St Paul's Cathedral; and The Commander (Ruder's The Handmaid's Tale) in the British premiere for English National Opera. Apart from his personal commitment to performing New Music , Stephen Richardson performs traditional repertoire regularly. For ENO he has also sung Baron Ochs (Der Rosenkavalier) and Daland (The Flying Dutchman). He has appeared in Biily Budd at the Royal Opera Covent Garden and L Opéra de Paris, Bastille. He has recently made his debut at Opera Australia in the title rôle of Verdi s Falstaff and Sarastro in Die Zauberflöte. Last Season he performed Adès  Powder Her Face at the New Mariinsky Concert Hall in St.Petersburg. 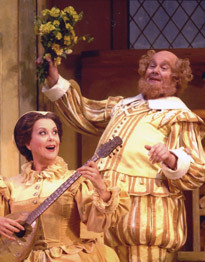 Stephen has appeared in many major international opera houses and festivals in over one hundred different roles. Such houses include La Scala,Milano , Santa Fe Opera, Chicago Lyric, Salzburg Festspiele, The Royal Opera, Covent Garden, The Netherlands Opera, Opera de Paris, Hong Kong Festival, Canadian Opera and Opera Australia. Since his professional début in 1981, Stephen has appeared as soloist with some of the worlds leading orchestras and ensembles, most notably The Cleveland Orchestra, The London Symphony Orchestra, The Vienna Philharmonic, The London Philharmonic Orchestra, The Philharmonia, The Philadelphia Orchestra,The Prague Symphony, The Boston Symphony Orchestra, The NHK in Tokyo and many more. An impressive list of his conductors range from Muti and Maazel to Pinnock and Sir Colin Davis. Future appearances will include the role of Rocco in Fidelio, Ashby in La Fanciulla del West  in Denmark , Flint in Billy Budd  at the Netherlands Opera, and Henry VIII in Peter Maxwell DaviesTaverner. "...Stephen Richardson's Morosus is Falstaff, Ochs and Strauss in one - A comfortably lived-in performance that reveals a versatile character bass..."